The following is adapted from testimony presented to the House Judiciary Subcommittee on Immigration Policy and Enforcement on March 10, 2011. Because five months have passed since the release of our report, I have taken this opportunity to update our results through the fourth quarter of 2010. The updated results show that the economic recovery is now offering more widespread job opportunities for both native-born and foreign-born workers. More specifically, in the one-year period from the fourth quarter of 2009 to the fourth quarter of 2010, foreign-born workers gained 657,000 jobs and native-born workers gained 685,000 jobs. The unemployment rate dropped for both groups during this period. 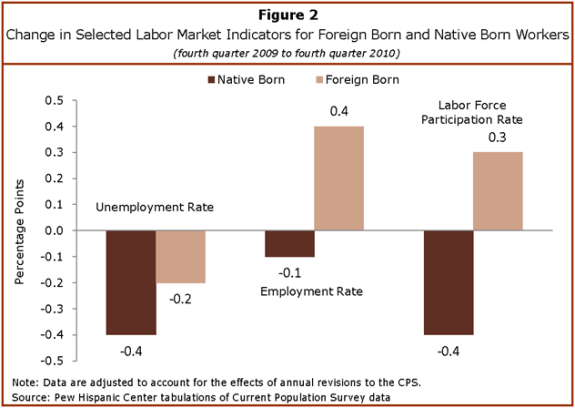 For immigrant workers it fell 0.2 percentage points (from 10.1% to 9.9%) and for native-born workers it decreased by about 0.5 percentage points (from 9.5% to 9.0%). The fourth quarter of 2010 is the first period since the middle of 2008 that native-born workers have experienced positive jobs growth (growth being measured as the change over the same quarter in the previous year). For foreign-born workers, the fourth quarter of 2010 marks the third successive period of jobs growth. Thus, the economic recovery now appears to be benefiting all workers, although the gains to native-born workers have been a bit later in coming. But the jobs recovery has been far from complete for either group of workers. From the beginning of the recession in the fourth quarter of 2007 to the fourth quarter of 2010, native-born workers lost 6.1 million jobs, a drop of 4.9%, and foreign-born workers lost 262,000 jobs, or a drop of 1.2%. The unemployment rate for native-born workers is up from 4.6% to 9.0% and for immigrants it is up from 4.5% to 9.9%. The reasons that the initial stage of the economic recovery has proceeded differently for native-born and foreign-born workers are not entirely clear. One factor might be greater flexibility on the part of immigrants. Research by others suggests that immigrants are more mobile than native-born workers, moving more fluidly across regions, industries and occupations. The flip side of flexibility can be jobs instability and a loss in earnings. Our own (unpublished) research finds that immigrants are more likely to exit from and enter into employment on a month-to-month basis. Our October 2010 report also noted a sharper decline in earnings for immigrant workers from mid-2009 to mid-2010. Our review of the data for the final two quarters of 2010 suggests that this differential persisted through the end of last year. Another reason that immigrants found greater success in regaining jobs at the start of the recovery might simply be that their employment patterns are more volatile over the business cycle. Statistically, that means they are subject to greater extremes — both good and bad. In other words, immigrants register sharper losses in the early stages of recessions but rebound quicker in the recovery. That pattern played out in the 2001 recession and recovery, and it appears to be repeating now. The downward trajectory of job losses during the recession was steeper for immigrants and now they are seemingly on a steeper climb out of the recession. Demographic changes, both short term and long term, might also be a factor in determining employment trends in the recession and recovery. The ebb and flow of immigration is sensitive to the business cycle, with economic expansions tending to boost inflows. A February 2011 report from the Pew Hispanic Center estimated that, coincidental with the economic downturn, the number of unauthorized immigrants in the U.S. labor force fell from 8.4 million in March 2007 to 7.8 million in March 2009. As of March 2010 there were 8.0 million unauthorized immigrants in the U.S. labor. Thus, it appears that the decline in the number of unauthorized workers in the U.S. has stopped. As economic volatility diminishes, longer-term demographic trends are more likely to reassert themselves in the jobs market. The immigrant share of the U.S. working-age population (ages 16 and older) has been on the rise for several decades, especially since 1990. Slightly more than 15% of the working-age population is foreign born, up from a little less than 10% in 1995. Because the foreign-born working-age population has been growing faster than the native-born population, the number of immigrants in the labor force and the number employed have tended to rise faster than for the native born. 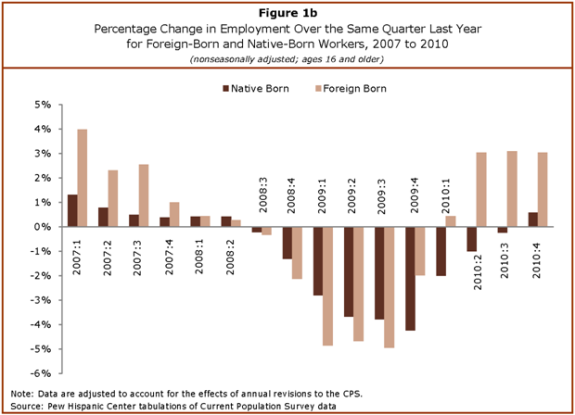 The pattern during the current recovery is consistent with the long-run demographic trend — from the fourth quarter of 2009 to the fourth quarter of 2010, the foreign born labor force increased by 668,000, while the native-born labor force increased by 146,000. View more charts and information in the complete congressional testimony at pewhispanic.org. 1. Unemployment data cited are not seasonally adjusted.